As we all know, our ears play an important role in how we communicate and interact with the world, but they also play a part in how we maintain our body’s balance. “In the inner ear, the balance system consists of three semicircular canals that contain fluid and “sensors” that detect rotational movement of the head. Each of the semicircular canals lies at a different angle and is situated at a right angle to each other. 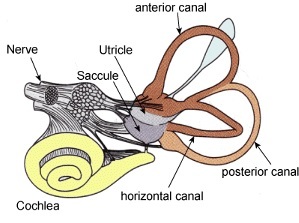 The semicircular canals deal with different movement: up-and-down, side-to-side, and tilting from one side to the other. All contain sensory hair cells that are activated by movement of inner ear fluid (endolymph). As the head moves, hair cells in the semicircular canals send nerve impulses to the brain by way of the acoustic nerve. The nerve impulses are processed in the brain to help us know where we are in space or if we are moving. Sometimes the fluid in our inner ear continues to move even when we are stopped causing us to feel dizzy or off-balance. KidsHealth.org provides a creative way to demonstrate this to patients of any age: fill a cup halfway with water and then move it around in a circular motion. When you stop and hold the cup still the water is still moving. Our balance system is important not only for how we stand and stay upright on our feet, but also for how we run, walk and move. The ear impacts so much more than your hearing! This entry was posted in Audiology Awareness and tagged Ears and Balance, Vesitbular System. Bookmark the permalink.